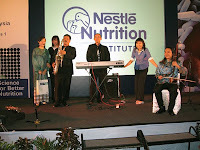 This is the third part of Nestle's 1st Scientific Symposium held in Kota Kinabalu, Malaysia on the 3rd of May 2008. JaysJam live music trio was the main entertainment for the night providing lively instrumental music. 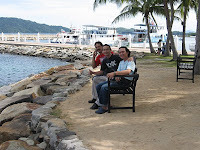 The audience were made up of mainly doctors who were extremely receptive to the colorful three piece band comprising of Tom on Tenor and Soprano Saxophone, Chan on Er Hu(Chinese Violin) and band manager Jason Geh on keyboards. 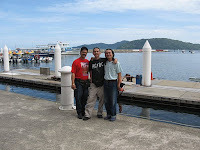 Tom, Malaysia's most versatile Saxophone player went down to the audience and serenade them with his rendition of Kenny G numbers. Chan, with his selection of Teresa Teng favourites mesmerize the crowd with his soothing tones and charismatic demeanor. And Jason, providing the support crucial to the band handling the piano, bass and drum parts proficiently with his mastery on the keyboards. Non of the music performed were pre-programmed nor was it sequenced unlike most lounge keyboardist do. That is the specialty of JaysJam, the ability to play a wide range of music "live" with just a trio and sounding exciting, full and complete. 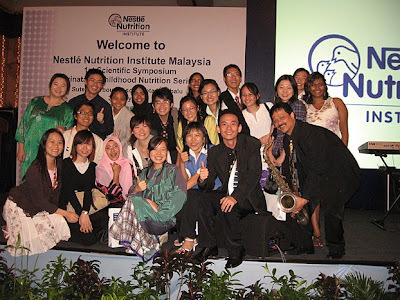 This event was held in the ballroom of Pacific Sutera Harbour Resort in KK. 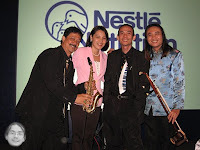 JaysJam performed for the 1st part of the symposium as well at G Hotel, Penang last week(26th April). A special thanks to Joanne for her professionalism, her 5 star hospitality shown to the band and for making it all possible for JaysJam to share their brand of music to a group of people who appreciate quality music and are not shy to show it.